Crescent Moon - Universe Galaxies And Stars Section. Dione seen as a crescent moon. Cassini took this photo on May 3, 2006 at a distance of approximately 1.8 million kilometers (1.1 million miles) from Dione. This photograph shows Saturn’s Moon Dione as a thin crescent beneath the luminous F ring. 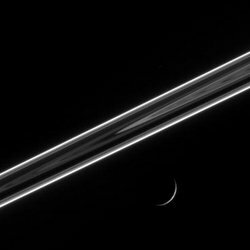 The image shows the dark side of the rings, so they’re not illuminated directly by the Sun. The dark side of the ringplane glows with scattered light, including the luminous F ring, which shines like a rope of brilliant neon. Below, Dione (1,126 kilometers, or 700 miles across) presents an exquisitely thin crescent.